It is always nice to be able to sit down and relax and enjoy a good dip and I am always looking for interesting new dips to try. I recently came across a very interesting idea for a feta salsa dip on smitten kitchen and I knew immediately that I would have to try it. This feta salsa’s primary ingredients are feta, olives and sundried tomatoes which are all near the top of my list of favorite ingredients. From there you finish the salsa off with some herbs and olive oil. I decided to add some garlic and for the herbs I was thinking Greek and went with some fresh oregano. I was also planning on adding some green onions but I forgot that I was out and had to skip them. (Thinking about it now, I had some red onions that would have worked well.) Given the simple list of ingredients you want to use some good ones and I took the opportunity to pick up some nice imported Greek sheep milk feta and some nice olives. The feta “salsa” turned out really well! It was nice and tasty and so packed with flavour! I enjoyed scooping the the feta salsa up with whole wheat pitas when I served it the first time. The leftovers went really nicely on salads and I added about a tablespoon of it to my next few bowls of salad during the week. This looks fantastic! Yet another awesome creative dish! That looks amazing! Love the flavors here. WOW – what an interesting looking dip with minimal fuss… great work Kevin. Will definitely be giving this one a go! Nice one. This is what I put on my baked mushrooms about 12 hours ago. I was literally thinking of making a dip a few hours ago. Lucky me, I have all the ingredients to make this! Yum! Nice and easy! Look at those awesome feta chunks! YOU’VE OFFICIALLY ROCKED OUR FREAKIN’ SOCKS OFF!!!!!!!! This is the ticket. Hand over some pita chips so we can go to town. I bet this mixture would be good slathered over a whole, fresh pita and then broiled or folded to make a panini, too. This sounds so interesting! I love feta, so I definitely want to try this – with pita chips! This is so interesting and different – sounds great! I’m gonna be making this soon! When the smitten kitchen first posted this recipe I think I got up from my computer right away and went to the grocery store. I was tempted to sit and eat the whole bowl with a spoon but resisted and stuffed chicken breasts with it instead. That was very tasty! Delicious! I will be making this soon! Oh yum! And this seems so versatile. I think it would be yummy as a topping on a grilled portobello or turkey sandwich. I’ll definitely have to try this one. Very interesting dip, it looks like a great condiment to go with other foods beyond a dip. You may have won yourself another follower with this. That looks really good right about now. The weather is perfect for it where I am. This is a deconstructed Feta and sun-fried tomato vinaigrette. I’ve made a dressing similar ingredients and it’s rather good. Glad you enjoyed it and I’m always happy to see Feta in use. Delicious! feta love the flavors. WOW that looks incredible – I cannot wait to make this. So simple and yet so full of flavor! Gorgeous! I could eat that dish right now! I know the combination well and love it! Sundried tomato, kalamata olives, feta cheese, olive oil and oregano are the flavours of my "Greek Rigatoni" mac & cheese recipe. Good stuff. MMM! I never even thought of using feta for salsa! Yum! Yum to feta! I LOVE feta and could eat it all day. Looks delish Kevin. Yummy! Great salsa for the summer! I recently made your Ginger Pork (you made it back in 5/2007) and it turned out great! It will definitely be added to my dinner rotation. You have a lot of pork/Japanese recipes I want to try. Thanks! I’ve never heard of that. And you know I do eat a lot of salsa but I am so tired of it. I must try this. Looks wonderful Kevin…another great idea! What an interesting salsa! It looks great. I wonder if it would be good pureed a bit in the food processor, too. yum! Something I learned early on when I fell in love with a creamy brand of feta: Not all feta cheeses are created equal! I believe the feta you choose for a recipe like this is critical to a “wow” outcome! The low end of the spectrum would have to be the pre-crumbled stuff sold in supermarket deli cases. Dry, salty and no flavor. As for my favorite, if you American readers have access to a Trader Joe’s, they carry a sheep’s milk feta from Israel called “Pastures of Eden” brand. It comes in a plastic bag with a small amount of brine. The bag is a distinctive yellow and green color. This is hands-down the best feta I’ve had in years! When I remove it from the bag, I rinse under cool running water and store in a tightly sealed container. So Good! (Oh, and I have no connection to Trader Joe’s or the cheese company. Just wanted to pass this along). This recipe will be on my table this weekend! Thanks Kevin! Great flavors and so different! That is gorgeous. I want to eat it with crusty bread! That’s basically my greek salad with some pepperoncinis and a little lettuce thrown in. 🙂 Thanks for sharing as I didn’t see this one. Now THIS looks good – I could eat bowlfuls of this! This looks fantastic! This salsa also called my attention on Smitten Kitchen. I want to save it for when I get my hands on my favourite kind of feta: Bulgarian. I like your choice of herbs and, I concur, some marinated red onions or even shallots would be nice too. I asked you a questions about the type of lamb you use for stews/tagines in an older post how silly! So I repeat it here 🙂 Which cut do you use? Oh wow! 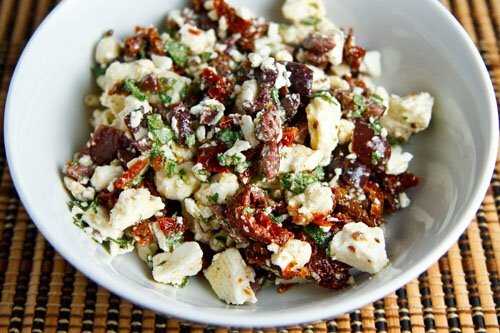 Feta, olives and sun-dried tomatoes are always perfect together. I have been meaning to try this recipe too. Feta is my favorite cheese so this dip is calling my name. Looks great Kevin. Excellent! I looked up Smitten Kitten’s recipe, also. Do you know each other? It’s almost like jazz the way you played off of his salsa theme. I may try a little cilantro in my next batch just to get a little fusion going on. That looks fantastic! Great flavors. have to try this one! You saved my day. I’m having a dinner party in a few weeks, and was racking my head for a simple yet bold appetizer. This feta salsa sounds like my perfect solution. Yum! Now that is my kind of salsa! Feta is one of my favorite cheeses. This dip sounds interesting and delicious. I highly recommend making the flatbread Smitten Kitchen author makes to go with this. Super easy, quick and really delicious with the salsa. Oooh, I have all of these ingredients on hand right now! I adore Greek food and this sounds like a perfect accompaniment to a Greek meal. I’ll have to give this a try next time I serve souvlaki. This looks so delicious!!! I love love love feta! I second Michael in Phoenix's recommendation for Trader Joe's "Pastures of Eden" feta in the yellow & green bag. Best feta ever! I added roasted red peppers to make this dip extra fantastic! I made this dip for a party. It was so simple to make and really yummy. I found the tomatoes and olives on the Whole Food olive bar. Next time I might leave out the raw garlic as people seemed to shy away from that lingering taste in a social setting. Otherwise, I loved this dip and will definitley make it again. This was so tasty that I made it 2 days in a row for 2 different parties. I had NO leftovers whatsoever. Thanks for posting a great recipe!